Car ads may give drivers the impression some vehicles can drive themselves. Experts say manufacturers are lulling drivers into a false sense of security by using terms such as 'autonomous' and 'autopilot' in their advertising. 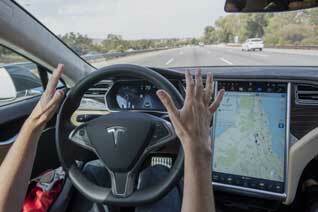 But it poses a danger as drivers become over-reliant on the technology. They may lose concentration at the wheel because they think the car will drive. Experts say fully self -driving cars are still a long way off . Car makers have been warned of the dangers of suggesting vehicles with some automated features can drive themselves. Thatcham Research called for car makers to make sure drivers are clearly told what vehicles sold with automated technology can and cannot do.